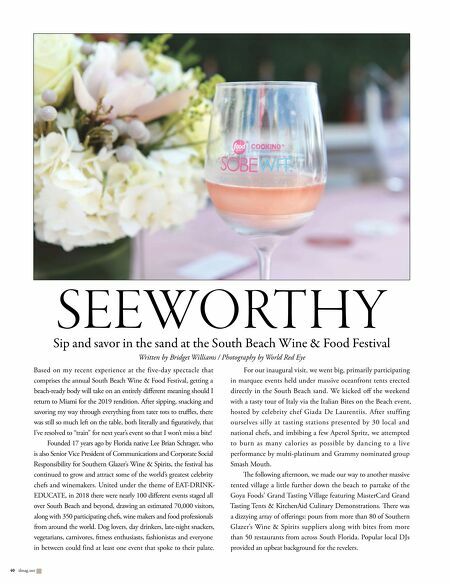 SEEWORTHY Sip and savor in the sand at the South Beach Wine & Food Festival Written by Bridget Williams / Photography by World Red Eye 40 slmag.net Based on my recent experience at the five-day spectacle that comprises the annual South Beach Wine & Food Festival, getting a beach-ready body will take on an entirely different meaning should I return to Miami for the 2019 rendition. After sipping, snacking and savoring my way through everything from tater tots to truffles, there was still so much left on the table, both literally and figuratively, that I've resolved to "train" for next year's event so that I won't miss a bite! 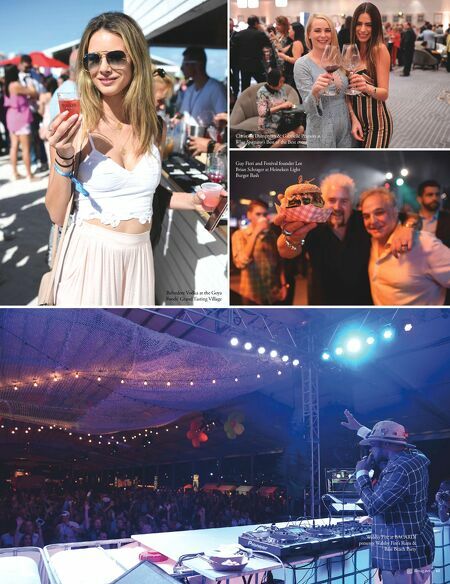 Founded 17 years ago by Florida native Lee Brian Schrager, who is also Senior Vice President of Communications and Corporate Social Responsibility for Southern Glazer's Wine & Spirits, the festival has continued to grow and attract some of the world's greatest celebrity chefs and winemakers. United under the theme of EAT-DRINK- EDUCATE, in 2018 there were nearly 100 different events staged all over South Beach and beyond, drawing an estimated 70,000 visitors, along with 350 participating chefs, wine makers and food professionals from around the world. Dog lovers, day drinkers, late-night snackers, vegetarians, carnivores, fitness enthusiasts, fashionistas and everyone in between could find at least one event that spoke to their palate. For our inaugural visit, we went big, primarily participating in marquee events held under massive oceanfront tents erected directly in the South Beach sand. We kicked off the weekend with a tasty tour of Italy via the Italian Bites on the Beach event, hosted by celebrity chef Giada De Laurentiis. After stuffing ourselves silly at tasting stations presented by 30 local and national chefs, and imbibing a few Aperol Spritz, we attempted to burn as many calories as possible by dancing to a live performance by multi-platinum and Grammy nominated group Smash Mouth. e following afternoon, we made our way to another massive tented village a little further down the beach to partake of the Goya Foods' Grand Tasting Village featuring MasterCard Grand Tasting Tents & KitchenAid Culinary Demonstrations. ere was a dizzying array of offerings: pours from more than 80 of Southern Glazer's Wine & Spirits suppliers along with bites from more than 50 restaurants from across South Florida. Popular local DJs provided an upbeat background for the revelers.